In the wild, hedgehogs are found in various habitats, but many species of hedgehogs share the same behaviors. These behaviors -- including burrowing and nudging items with their pointed snouts -- are mimicked in captivity, providing entertainment for hedgehog owners. Creating an ideal habitat for a pet hedgie isn't difficult, but you do have to keep a few basic hedgehog needs and behaviors in mind. 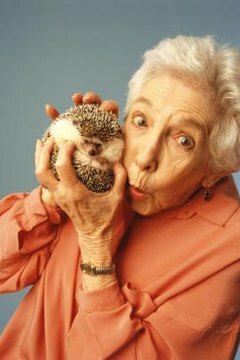 Hedgehogs require some sort of enclosure to keep their curiosity and rambunctious natures from getting them into trouble. Aquariums and plastic tubs both make acceptable homes as long as you provide good ventilation. Rabbit and ferret cages are also acceptable as long as they don't have wire floors and the bars aren't wide enough for your hedgie's head to slip through. Homemade C&C cages, which stands for Cubes and Coroplast, are made from corrugated plastic signing material and wire shelving units and can be relatively inexpensive homes for hedgehogs. The cage should offer at least 8 square feet of usable floor space; a multi-level home can provide additional space, excitement and exercise for your hedgehog, and should be considered if space allows. Hedgehogs love to burrow and do so frequently, making your bedding choice an important feature in his habitat. Cloth cage liners are ideal because they are warm, soft and won't injure your prickly friend. Flannel and fleece work well, but you need to change them every day. Bedding material can also include paper bedding that comes in several forms, aspen shavings and corn cob bedding. All can pose problems to your hedgehog's health, but these three are generally considered safe. For example, aspen is generally considered safe for sensitive hedgehogs, but the sharp edges can hurt their eyes and delicate skin. Corn cob succumbs to rotting easily, but is safe when cleaned at least every other day. On rare occasion, some hedgehogs have choked on recycled paper chunks, although paper absorbs moisture and odor, and is soft enough for burrowing. Hedgehogs tend to be rather playful, but you don't need to spend a small fortune on toys. A solid exercise wheel made for chinchillas or hedgehogs is a must; hedgehogs require exercise to remain healthy. Toys can include cardboard tubes and boxes, PVC pipe wide enough for her to comfortably walk through, and hard plastic balls. Your hedgehog should have food and water bowls. Food dishes are commercially available at nearly anywhere pet supplies are sold. Small ceramic crocks designed for larger rodents are ideal. They shouldn't be more than about 3 inches tall and should be at least 3 to 6 inches wide. Water bowls need cleaned out and refilled at least daily and should be rather shallow, like the food bowl.